I use coconut oil when I am frying things that do not require as much heat (like eggs, chicken, or vegetables). I like coconut oil for the flavour. It is also a medium chain fatty acid that is metabolized for energy source efficiently than long chain fatty acids. When I am frying things meats that require more heat (like steak or burgers) I will use avocado oil. It also tastes very good. I occasionally even put in a table spoon of one of these oils into my smoothies when I am making a meal replacement shake. For best flavour of coconut oil my brand of choice is Organic Traditions and for avocado oil it's Chosen Foods. Raw cacao nibs are good for energy and focus (caffeine content), magnesium (lower blood pressure and relax muscle), and fiber. Cacao nibs are very bitter and have an acquired taste that takes getting used to. The powder is less bitter but also contains less fiber so there is a bit of a trade-off. In this category I have not found a brand that separates itself from the rest in taste and quality. I choose Navitas because it is fairly inexpensive. Goji berries are nutrient-dense in vitamins in minerals and they have a high protein content for fruit. As a bonus, they taste amazing! I have tried goji berries from many brands. They all tend to be overly dry and lack flavour. This is where Dragon's Herbs beats the competition hands down. Their Heavy Mountain gojis are by far the best I have ever tasted. They are moist and juicy. I have even collected seeds from the berries and grown goji plants (this takes two years). They are very hardy and can handle varied temperatures and humidity like we have in Canada. These are my two salad dressings of choice for flavour. I like going light on the calories with my sauces and dressings because they can quickly add up in the long-term. These add about 60 calories to your salads. I like salads of the "superfood", nutrient-dense variety. They usually containing kale, spinach, chard, and broccoli. I like to toss in home-grown sprouts (many kinds) to give an added nutrient boost and add texture. Other ingredients I frequently put in salads include: a small sprinkling of seeds or nuts and cranberries (or other dried berry) and sprouted quinoa, and hemp seeds. These dressings are not available on Amazon. I purchase mine in Toronto at The Big Carrot or Healthy Planet . 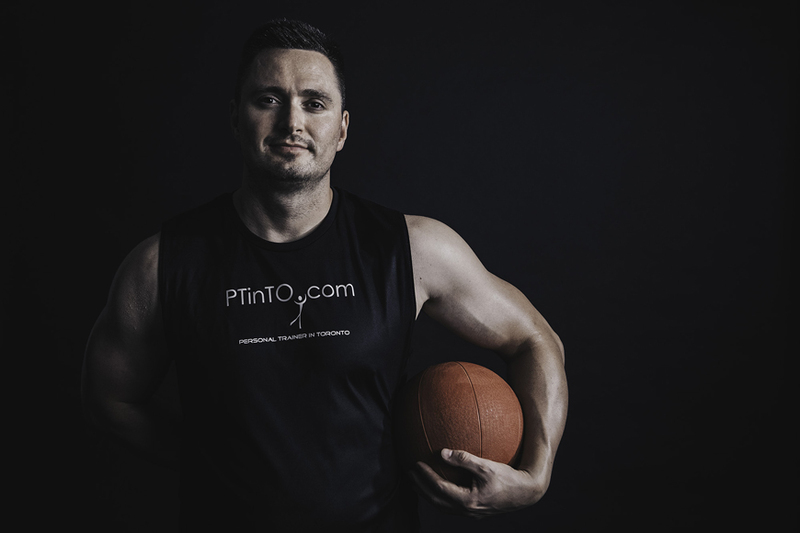 Online, they may be purchased at Well.ca. For those, outside of Toronto and Canada, they are likely available at major health food stores. When looking for sauces I am focusing on two criteria - taste and lower in calories. I use Hot Mamas Jerk n' Hot sauce on burgers and chicken. This gives the food a little bit of heat and so much flavour. This sauce is only 10 calories. This sauce is not available on Amazon but they have the same spice as a rub. 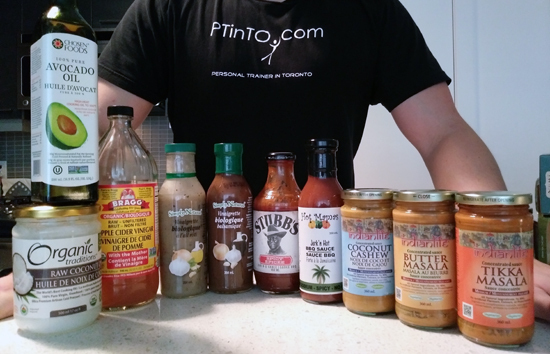 I purchase my sauce from Healthy Planet in Toronto. I use also Stubb's Spicy BBQ for burgers and chicken. It is nothing fancy, just a good basic spicy sauce that is only 30 calories. I use Indlanlife sauces (coconut cashew or masala) on chicken. They contain 160 calories per cup but you can get away with using less if you are overly concerned with your caloric intake. You really can't go wrong with Indian flavours. Amazon does not have these available. I also purchase these at Healthy Planet. 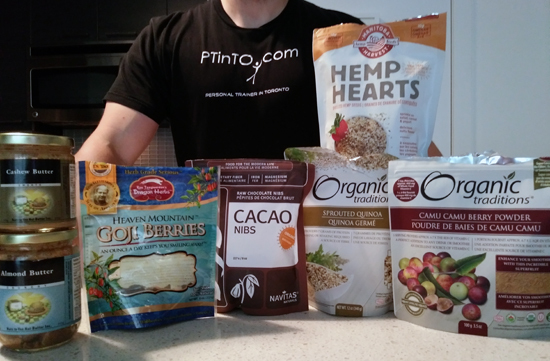 I use hemp seeds for a nutrient boost - protein (containing many amino acids), healthy omega 3+6 fats and fiber. They also contain an array of minerals and vitamins- especially magnesium, zinc, manganese, and vitamin B. I like to sprinkle hemp seeds on steel cut oats or salads. Hemp seeds have a bit of a nutty flavour. Sprouts add flavour and texture to salads. They are also loaded in vitamins and minerals compared to their adult counterparts. I grow my own sprouts in a BioSnacky sprouter/germinator. They usually are ready within 3-6 days depending on the seed. They require soaking at first, then watering twice per day. Sprouting is very simple. 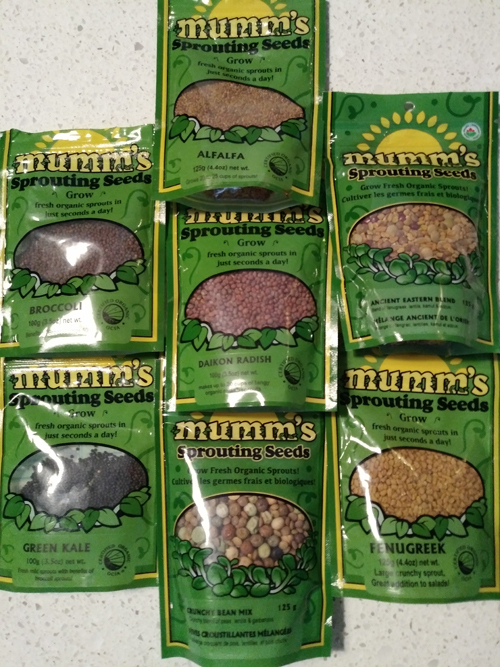 Mumm's Sprouting Seeds are reliable/viable - producing a good yield. They are also very tasty. I really like some of their selections for mixes including the Ancient Eastern blend and the crunchy bean blend. I also regularly use kale, broccoli, fenugreek, and alfalfa sprouts. I believe these sprouts are only availabe in Canada. Sprout House in the U.S. offers similar products. Nuts to You Butter makes my favourite nut butters. I particularly like their cashew and almond butter - they are smooth and creamy and taste awesome! I sometimes add a tablespoon to smoothies, eat it on its own, or use it as a spread when I occasionally have toast. 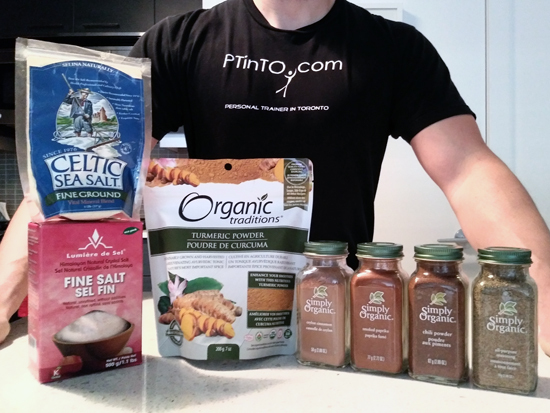 In Toronto, these nut butters can be found at The Big Carrot and Healthy Planet. Braggs organic raw apple cider vinegar is my favourite ACV. Many say quality is determined by appearance when it comes to ACV. It is has a murky appearance and there are strands ("the mother") that is a good sign that it contains the beneficial protein, enzymes and baceria. I use a tablespoon in a warm glass of water first thing in the morning and before going to bed. Some of its many benefits include: blood sugar control, cholesterol reduction, weight loss enhancement, immune system health, gut health/digestive health, acid reflux control, and healthy skin. ACV has an alkalinizing effect on the body helping to keep pH levels balanced for optimal overall health. I regularly use Himialayan salt or Celtic salt in most of my cooking. These salts are loaded with minerals compared to standard table salt and have a much better flavour. Selinas Celtic Salt has "over 74 vital trace minerals and elements." You require only a quarter to a half a teaspoon for flavour. 1. Simply Organic Ceylon Cinnamon, Smoked paprika, All-purpose spice, Chili. I commonly use smoked paprika, chili, and all-purpose spice (which contains onion, black pepper, garlic, parsley, celery seed, tomato powder, basil, thyme, oregano, sage, and coriander) are commonly flavouring for stirfry, stews, and other meals. I use ceylon cinnamon mainly in shakes and on oatmeal. It provildes a flavour boost but also I helps enhance insulin sensitivity. I also frequently use turmeric as it tastes great and has numerous health benefits (especially from the curcumin that it contains). Note: turmeric does not contain a high percentage of curcumin (usually only 2-4%), so if you want to enhance these benefits it is ideal to get curcumin extract. Some of the properties of curcumin are: anti-inflammatory, antioxidant, boosts brain-derived neurotrophic factor (BDNF) for brain function, anti-cancer, and more. To unlock these benefits, it is important that turmeric is cooked/fried with black pepper and a fat source/oil (I use coconut oil). I regularly sprinkle quionoa on salad or steel cut oats. I occasionally also have it as a side dish instead of rice. A serving of quinoa contains 7 grams of protein, 1 gram of sugar, and 4 grams of fiber. Boil sprouted quinoa for only 10 minutes. I can be prepared even faster in a pressure cooker. I like to sprinkle in some Himalayan salt or Celtic salt for taste. I love the taste of coffee and the physical and mental energy boost it provides. I will a few coffees a day and especially before workouts. Caffeine is a scientifically-proven performance booster and fat burner. Sometimes I add cacao powder and coconut oil and sometimes go black with a touch of cream. A good taste test for coffee to drink it black. In my life-time I have tried hundreds of different coffees sourced around the world. Typically, Hawaiian Kona, Jamaican Blue Mountain, Kenyan AA, Ethiopian Yirgacheffe, and Indonesian luwak coffee rate high amongst coffee afficionados. These coffees come with a heavy price tag ranging from $60-$200USD+ per bag. While they are great, I have found 5 great competitors that are way less expensive and just as good in smoothness and flavour (in my opinion). And for those who look for a high kick of caffeine to start the day, Death Wish Coffee is the one to choose. It you didn't feel like working out today, you will after you have had a cup of Death Wish coffee. There are claims that it is the world's strongest coffee and I believe it. They will refund you if it is not the strongest coffee you have ever had. If you are highly sensitive to caffeine it might be a good idea to avoid this one. This coffee has a dark chocolate flavour with notes of cherry and almond. These organic and fair trade (mix of Arabica and Robusta) beans are sourced from India and Peru. This coffee is a blend of Indonesian, and Central and South American beans. This coffee has a walnut and toast flavour. Many coffee drinkers who have compared Death Wish original blend with Valhalla Java prefer the taste of the Valhalla Java. But they also choose the original blend as their kickstart coffee. From Koffee Kult's website, "Koffee Kult Medium Roast Coffee Beans and Ground are of the highest quality. Our medium roast coffee is less grainy than light roast coffee and has a balanced flavor, aroma, and acidity. Koffee Kult Medium Roast Coffee Beans are a combination of Brazil and Colombian coffee beans. Surprisingly, Koffee Kult Medium Roast Coffee has more caffeine than the darker roasts. A hot cup of Koffee Kult's medium roast is not only a smooth finish, but it will also jump start your day!" From Illy's website, "A special coffee with a mild, delicate aroma and a unique perfume with distinctive floral notes of jasmine and a hint of citrus fruit." This has a dark chocolate flavour. It is smooth and has low acidity (easy on the GI tract), and kinda. If you are looking for a pick me up to start the day this is not the number one choice because it is pretty weak. It tastes good black or with cream and coconut oil. I am more of a coffee drinker than a tea drinker. However, there are a few different teas that I enjoy later in the day as they are not overly stimulating. 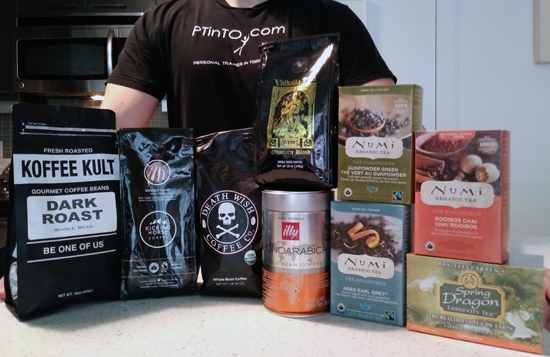 These teas are loaded with nutrients (especially the Spring Dragon Longevity herbal mix) and great flavours. They are all organic and do not contain pesticides. 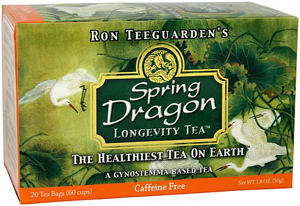 Spring Dragon Longevity tea is a gynostemma-based tea. It is caffeine-free. Gynostemma is consumed daily in Asia as a "longevity tea." It has a fruity flavour that is delicious and not overly sweet. It contains other potent herbs/fruits including: schizandra berries, goji berries, astralagus root, eleuthero root (Siberian ginseng), luo han guo fruit. Some of the combined benefits and properties of all of these ingredients include: physical and mental energy and endurance, antioxidant, vision health, and immune system support. Numi's description, "Piquant cloves, nutmeg, and cinnamon mingle with sweet allspice, vivacious ginger and a kiss of cardamom. Great with milk!" Numi's description, "Within hours of being plucked, this whole leaf organic green tea is gently steamed and then rolled into small tight pearls. When steeped, the leaves unfurl, releasing a well-rounded, full-bodied flavor." Numi's description, "We age organic Assam black tea with real Italian Bergamot for several weeks so the tea absorbs the orange scent. Enjoy a robust (flavorings-free) Earl Grey with subtle citrus notes.